We always hear e-marketers debating about optimizing their web content for search engines because they know it's something well within their control to do when it comes to page title, post title, image, url, content. You should certainly spend a couple minutes checking out your on-page SEO, before you publish new web content, but it isn't something marketers should be obsessing over anymore. Google's algorithm is much more sophisticated than it was even a few years ago. Through extensive research and trials, Eyemails team was able to dig deep into "search engines" and find out the ins & outs. 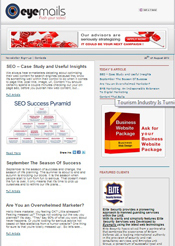 With a period of less than 3 month Eyemails team was able to drive immense traffic to their company's website. Eyemails website is now listed on the first page between the first 5 search results on google for searches with keywords like "email-marketing-lebanon". Traffic can be driven by rich and useful content. For this reason a monthly newsletter was created. Eyemails' team of professionals and specialists in the fields released many case studies, researches and testimonials from local and international markets. Some other abstracts were chosen carefully serving the newsletter topics. On the other hand the team prepares a list of topics to choose from for the coming newsletters issue. Topics are chosen by popularity corresponding to the business season. For example this newsletter issue is originally intended for the educational sector (universities, institutes, training centers… considering a new semester is approaching). By sending targeted e-mails, our clients showed a high level of satisfaction which can be translated by an increase of web traffic and potential leads. In some reported cases the conversion rate exceeded all expectations. "I received an Email ad about a certain product which I don't recall the name of the brand, and I was curious to check the sender and it was Eyemails, and it was the first time since I ever heard about this company. Did some research online, contacted them and did a trial which was a total success and the results where WOW. Straight away I asked for an offer and booked my shots for the entire year with Eyemails. I trust Eyemails for promoting Malik's and send our emails to the right data as they promised. Thank you Eyemails for your transparency and honesty." As reported by Mr. Rabih Dib Marketing Manager at MALIK'S Bookshop. 2012 saw a ton of advancements in paid advertising targeting options. For instance, did you know that twitter paid advertising now allows marketers to target their audience by interest or username? Did you know that facebook paid advertising now lets marketers target their audience by desktop or mobile? If you're investing in PPC (Pay Per Click) in any capacity and taking advantage of these advanced targeting methods then, congratulations, you're doing it right. If, however, you're dumping money into completely untargeted PPC, it's kind of like emailing your entire contacts database without doing any segmentation. Turn off your paid media spend that isn't leveraging targeting functionality, otherwise you're throwing your marketing budget right out the window. It is very important that your campaign reaches out to people you want to reach. Even if that overall volume is lower, the conversion will be higher. Most of all, when optimizing the social media channels that are driving success for businesses, it's okay to admit that a particular network doesn't work for you. We're the last ones to say you shouldn't be reporting on your marketing, but with the big Data explosion has also come a whole lot of time wasted interpreting numbers and analytics that don't really mean anything for you right now. A lot of spreadsheets and numbers does not make a marketing strategy. figure out exactly what numbers you need to know for your business' marketing, and do deeper dives into specific metrics as needed. It's a better use of your time, and frankly provides more actionable advice than running hours of reports at the end of each month that you never use. Analyze where your business has performed well, and where it has potential. Start focusing on these areas. As a specialist in email marketing services and SEO Eyemails is always pleased to share success stories some valuable insights for you to consider for while planning for your e-marketing success. September is the season of success and change, the season of life planning. The summer is about to end and autumn is knocking our doors. It is the season when people start to turn from fun to serious. That doesn't mean the fun is over, it only means that it's time to pick up ourselves and to rethink our life plans. Children are back to school. The universities are prepared to welcome a new semester. Educational centers are launching their latest and most improved courses. Business people are back from their vacation. 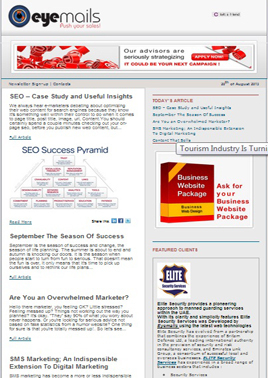 September is the high season for marketers. While everyone else are getting back on track marketers are already midway and ready to launch new campaigns. Over the years, Eyemails served many schools, universities and educational centers by providing them top-notch e-mail marketing services. And year after year Eyemails is acquiring new clients from the educational sector. This is the time of the year where e-mail marketing proves to be best for launching a new course or promoting a new specialization or certification. 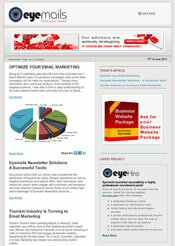 Eyemails is proud of the continuous success reported by its highly respected clients! If you are a school, college, university, an institute or a training center it is the right time to contact us an let us show you how we assisted other clients from the same field to launch a successful e-mail marketing campaign. 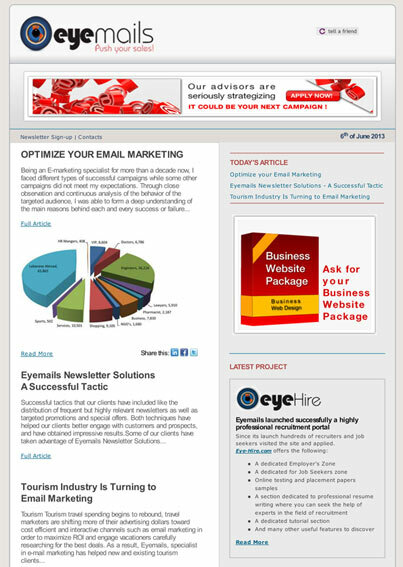 Salah Nasereldine: (Eyemails CEO) An Email Marketing Specialist and Consultant with more than 7 years of experience in his field. Salah worked with many large & small companies and helped them promote their products through email and social media marketing. During his career Salah filled different roles in the online sector, focusing mostly his effort on Email Marketing with one purpose "To enhance the relation between Businesses and Customers" using the new technologies of information and communication. 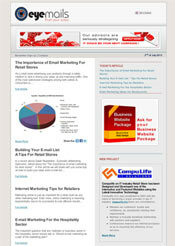 Specialties: Email marketing, Online Presence, Email Deliverability, Email Marketing Automation. Hello there marketer, you feeling OK? Little stressed? Feeling messed up? Things not working out the way you planned? It's okay. "They" say 90% of what you worry about never happens. Or you're looking for serious advice not based on fake statistics from a humor website? One thing for sure is that you're totally messed up! Contacting your entire unsubscribe list? Over budget? Unforgiving competition on social media? Well it's true! But a lot of the things that marketers waste time doing, and lose sleep over, are things we could totally chill out on. Here's a 10 list that can help you identify some. Typos in your company's Blog Posts: Don't impact meaning or clarity, don't worry about it. Try to prevent them, fix them when you find ones that slip through, and carry on with your life. In fact, just to show you that it's not the end of the world, I'm going to add a typo in in this post. See? Everything's still fine. 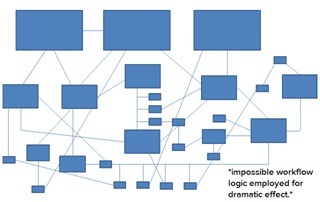 We set up more and more workflows and after they run for several months, realize we wasted hours thinking through that logic only to solve for .0007% of our database. Your brainpower and time can be used better elsewhere. Keep the workflows simple. Titles: As in the subject lines of your emails. It is fine to spend some time thinking of a compelling title. Or tweaking your email subject lines to make them more click-worthy. Once you've spent a few minutes making something both catchy, accurate, and SEO friendly, it's time to stop digging for better options. Readers will not be thinking about your word choice to that level, and your brain can be used for bigger and better things. Comments: Nobody commented on your blog post or on your latest marketing campaign! So what? … When you get wonderful, insightful comments, it's definitely a bonus. But it doesn't mean your content isn't good, valuable, or even downright genius. It just means that post didn't ... incite comments. If people are reading it, linking to it, and sharing it on social media, don't sweat it if no one comments. Clickthrough Rate Benchmarks: Looking at clickthrough rate is important. No question. But how you relate to other companies, and even data from within your own website, is impacted by so many variables that the benchmarks are rendered completely useless. It depends on how much traffic you're getting, what the call-to-action is, where on the site you are ... there are just too many variables to make a vague benchmark useful. Unless you find a similar proxy for the exact scenario you're trying to assess. Stop comparing yourself to others and focus on improving your own specific clickthrough metrics month over month. Sounding Smart: Stop worrying about sounding smart in your marketing content. Focus on being smart and sounding like a person. People like people. The Perfect Design: Amazing design is great! But it's not the be-all-end-all of your marketing, either. Function is more important than hot design. If your less-than-perfect design isn't making your users' experiences worse or more confusing, don't worry. Failure: Failure is fine. It means you did something. But if you're trying something new and it flops, pick yourself up, pat yourself on the back for thinking of a new way to move your metrics, and move on. SMS marketing has become a more or less indispensible tool in the hands of professional marketers. It is a matter of choosing the correct verbiage and sending bulk SMSs tapping the right customers by providing them relevant information. The reason why SMS marketing has proved to be one of the most important and effective ways of marketing; is because of the ever increasing number of mobile users. Since people don't have to stop and read a long advertisement, they are more than happy to receive relevant and crisp messages on their mobile phones in order to keep them updated about the latest line of products and services and also the discount offers which are introduced by the companies. The fact that most of the people are very attentive towards their mobile phones, they read their SMSs and answer their calls as soon as possible, makes SMS marketing services one of the most effective methods of communicating with potential and current customers. Nearly half the world's population use mobile devices. Locally, more than 85% of Lebanese consumers own a mobile phones, more than 60% of these consumers have more than one device. More than 95% of which have SMS or text-messaging capability. SMS, or Short Message Service is a powerful extension for email marketing. Especially for marketers who are seeking to engage more prospects and consumers. Statistics prove that 95% of text messages are read, 90% within three minutes of receipt. The open-and read rate, coupled with the extremely low cost of SMS, delivers a double boost for marketers seeking to maintain engagement via relevant, timely and welcomed messages. • Think of SMS as part of your extended email campaign strategy. • Use SMS to send order confirmations, like shipping alerts and other service-focused messages. • Use SMS to thank your clients for stopping buy and purchasing, but don't stop there — be sure to personalize these messages with coupons, or VIP treat program; And don't forget to add cross- and up-sell offers. • Make it a part of your cross-channel marketing strategy. • Integrate mobile and SMS into your campaign strategy when you're focused on customer acquisition and list building. • SMS is a building block for list growth and customer engagement. • Ensure you have opt-in permission from your customers. In point-of-sales make it clear that you are collecting the customer phone number and that it will be used to inform him about your business news (promotions, discounts, new collections…). Make it easy and clear for consumers to sign up for SMS messages. • Always include an unsubscribe option (recommended but not mandatory). Send one with every message and if a consumer selects the option, delete them immediately. Or provide a hot line for customer service where you deal aside with any complaint from an unsatisfied customer. SMS services providers these days made it easy for companies and businesses to send thousands of SMSs with a click of a button. All it needs is adding the short message, assigning the right cluster of contacts and you're ready to communicate with thousands in one click. SMS marketing service does not require any special skills, using SMS marketing systems such as Eyemails, you will be able to offer very professional SMS marketing service. This is one of the fastest ways of growing your business. The secret of running successful business lies in your ability to identify prospective markets and to become a pioneer in such markets. Do not delay any further, extend your portfolio by offering your customers with mobile advertising solutions. Here are some reasons why you should master your SMS marketing strategy in 2013. • The high open rates: the open rate is obtained by the number of opened SMS over the number of sent SMS in one shot. The open rates for text messages are much higher than the open rate for emails. Text messages are a much more personal method of communication due to the personal nature of mobile handsets. • The high conversion rates: marketing messages are an opt-in service. Your "clients" actually want to receive your messages (they accepted to give you their mobile number) so they are much more likely to engage with any material you might send via SMS such as promotional offers, competitions, or any website or social media links you might provide. • SMS messages get to the point: SMS messages let you get your message across in a limited number of characters so that your customers can get the information they need to know delivered directly to their handset in a matter of seconds. • low-cost: Because you only pay a small fee for the messages you send, you cut out the design, print and distribution costs that come with traditional marketing methods, and it's a lot kinder to the environment too!. Now if you still not convinced, give us a call on 961.5.955925 and one of our representatives will answer all your concerns. Content marketing is more important than ever. The B2B buying process has changed, and so has the B2B buyer. Gone are the days when salespeople actively "sold" to prospects and marketers would participate in "interruption marketing"– doing their best to get in front of prospective customers regardless of their level of interest or qualification. Thanks to the Internet, social media and other major online influences, prospects are spending more time on the Web doing independent research, obtaining information from their peers and other third parties. Companies are meeting prospective buyers earlier than ever, and they must avoid having sales engage with every early-stage lead that is not truly sales ready..
Marketo's definition of Content Marketing is "The creation and sharing of relevant content for the purpose of solving a problem and reinforcing brand messaging through thought leadership." It is not promotional – promotional materials will neither excite nor inspire, while good content can do so. It is relevant – generic materials that are not highly relevant to a reader will not result in increased success. When writing content you must make sure it will be useful to the reader, regardless of whether it supports your company message. It closes a gap – content marketing should answer a business question or problem. An added benefit of this useful information is its ability to be used in lead nurturing. It is written well – poorly written thought may not only provide poor results, but may also hurt the company's reputation. Take time to ensure content is presented in a thoughtful manner and is free of errors. It is relevant to your company – if the content you create does not support business objectives in any way, it is a waste of resources to produce. Keep business goals in mind when creating content. It gives proof – since you write to support a business goal, your content may seem biased. Make sure that content you create gives proof either through quotes and testimonials or through actual metrics and statistics. • 82% of prospects say content targeted to their specific industry is more valuable. • 67% say content targeted to their job function is more valuable. • 49% say content targeted to their company size is more valuable. • 29% prefer content targeted to their geography. *Complementing the facts listed in the above abstract from the "Marketo" eBook titled "Creating Content That Sells" we at Eyemails always advise our client to choose carefully the words and messages to include in their marketing campaign; especially "e-mail" marketing campaigns. Based on our experience successful e-mail marketing campaigns are the ones that trigger curiosity or inspire the consumers. Such winning content with an appealing visual will lead to a high Click Trough Rate (CTR) which is the goal of every marketer launching a campaign. By increasing your Click Through Rate (CTR) you are increasing your chances of capturing new potential leads. Many campaigns for well known brands did not reach the expected results due to a weak content or to a misleading visual while some of the least known brands have launched campaigns that exceeded all expectations due to a well structured and relevant content and visual. With Eyemails, you will benefit from our expert advices and opinions to lead a successful e-mail campaign with the right content and visual.